Shifting, orange sand stretches off in every direction, piling up 350 metres high in some places. Other camel caravans carry tourists around the dunes. 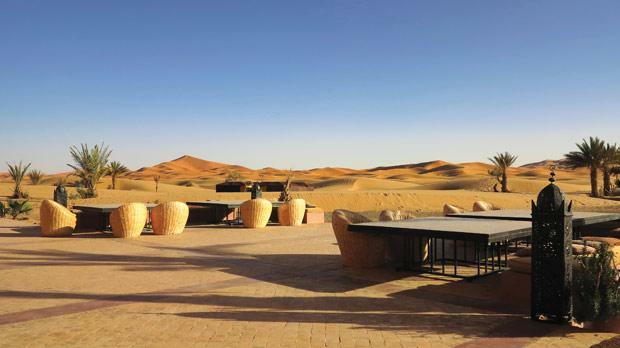 Hotel luxury seems at odds with the barren Sahara. 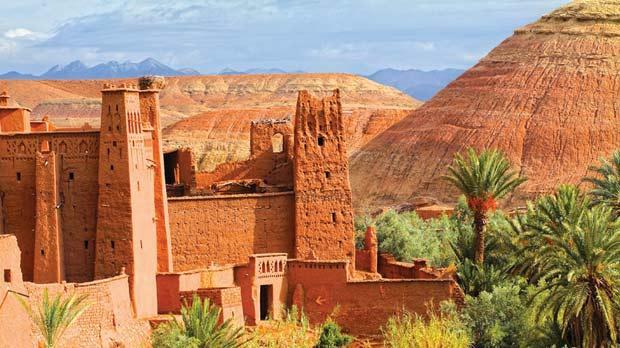 The 900-year-old kasbah Ait Ben Haddou has been used as a set for dozens of films. Stephen and his friend get the hump on holiday. 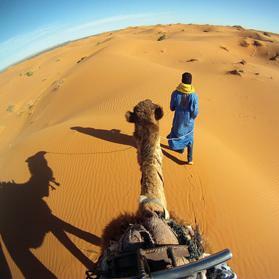 On a short break to north Africa, Stephen Bailey steps out into the Sahara Desert with only an uncomfortable, grumpy, hairy dromedary to guide him. Hamu looks at me and grunts, clearly unimpressed by my sweeping adoration of the landscape. He chews uncontrollably and releases some long, grassy drops, half of the excretion sticking to his thick hind hair. This is all done without breaking stride, and Hamu looks exasperated that I continually want to stop and take photos: it’s just sand, you foreign fool. Camels may look ponderous, but Hamu moves swiftly through the dunes, continually bringing new vistas as the sun burns through my makeshift headscarf. It’s not just sand, Hamu! Dunes rise to more than 350 metres, every angle is subtly different, and the wind is visibly changing the landscape every moment. On any world map the Sahara Desert looks imperious, a giant swathe of yellow and orange covering northern Africa and 11 countries. I’m here for two days, an amateurish duration given that Hamu often makes a five-month return trip from Morocco to Timbuktu in Mali. While he travels through untouched wilderness devoid of prints, I had to throw away half my baggage before passing the Ryanair test. 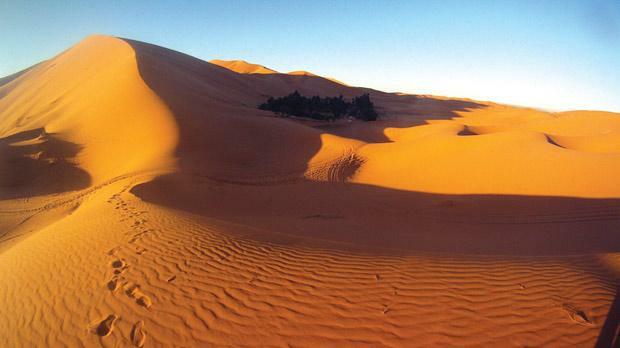 Nomads refer to the sea of dunes called Erg Chebbi near Mazouga as the ‘Coca-Cola desert’, as this strip of sand near the Algerian border is dominated by tourism. Hotels and camps line the edge of the sand, peering out onto a landscape that appears as threatening as it does beautiful. But sand conceals. Within moments of departing I’m already lost within a 360º panoramic of dunes. I see no other tourists or camels. I only see sand. And what sand! Ridges duck and weave, cutting great lines towards the horizon, and casting shadows into huge craters. Wind sweeps over the dunes, bringing immediate change and quickly rubbing away all evidence of our appearance. There are thousands of dunes, yet three dominate my vision. The Big Daddy rises without inhibition, while Mama and Papa hold hundreds of smaller dunes within their slopes. Hamu grunts again. What are you complaining about, Hamu? This is your office! Morocco is divided by the Atlas Mountains. 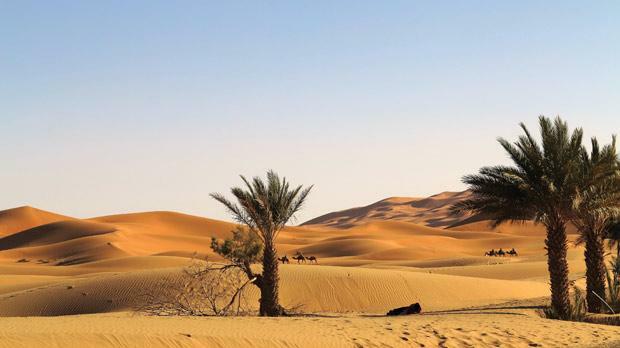 On one side lies the coastline and imperial cities such as Marrakech and Fez; fewer than 10-hours drive from either of these budget airline destinations is the Sahara. Organising private transport is easy, and public transport is surprisingly efficient. Two days ago, as the bus groaned across a mountain pass, I saw the weather divide. Behind me the clouds darted along the horizon and dots of snow clung to peaks. Yet, on the descent, there was only blue sky and a stark, scary landscape. Crossing this mountain range brings more change. Faces look darker, wrinkles deeper, and a swirling dust perpetually dances over rocky wasteland. Deep gorges run away from the mountains, their walls towering above tepid rivers. Dades Gorge was the most rewarding, a cafe terrace leaning over a road that resembles a school geometry exercise, each driver’s skills analysed over a pot of sweet mint tea. Vast swathes of nothingness passed by the bus window, punctuated by the occasional oases of palm trees and the odd kasbah, ancient mud-brick buildings shaped like fairytale castles. Some stand lost and isolated, decaying in the relentless, dusty wind. Others, like Ait Ben Haddou, date back 900 years and mark the entrance to brown villages than cascade down a mountain. Most people have seen Ait Ben Haddou before. Game of Thrones, Babel, Lawrence of Arabia, Prince of Persia, Legionnaire, and dozens of Egyptian and biblical epics were shot here. It was the location of the Gladiator arena, and waving a rusty sword I looked easily capable of taking on Russell Crowe. Just a shame that it doesn’t look anything like the film. But once I’d crossed the mountains, I was preoccupied with one image – riding a camel through the dunes. Hamu is not pretty. Curly wool grows in random clumps, while looking at his mouth is like gazing at a washing machine on a spin cycle. To my dismay he’s not even a camel, this one-humped variety officially called a dromedary; sorry, Hamu, Saharan camel caravan just sounds cooler. Nor is he comfortable. After three hours, a throbbing pain has developed and sitting down anywhere is painful. Afternoons are a quiet time in the desert, a hazy heat settling above the sand and a silence broken only by a buzzing fly. With Hamu resting I ascend on foot, gasping and wheezing as I hit the top. But where are the views? Every summit conceals another peak and in my sweaty delirium I can see Hamu laughing at me: stupid foreigner tries to climb the highest sand dune at the hottest time of the day. Fortunately, I’ve carried up a snowboard and the descent requires just two minutes and four falls. Late in the day we plod on, energised by caffeine and sugar, chasing a drawn-out sunset as the sand completes its transformation from yellow to red. With the camp in sight, a brilliant full moon rises, casting our caravan into silhouettes and bathing the desert in impossible light. Camel caravans usually construct makeshift nomadic camps, digging holes for toilets and rolling out mattresses on the sand. These indulgences might be the cause of the Coca-Cola desert, but this is a brutal place and I’ll happily trade comfort for authenticity. After just a single day my hair is completely matted with sweat and dust, each pocket contains enough for a sandcastle competition, and my body throbs unrelentingly from the sun. Morning brings new discomfort, a chilling wind tearing through clothes as we depart at sunrise. Hamu simply shrugs and keeps plodding, leaving me to silently gasp at the infinite possibility of sand dunes. By midday we’re back at the hotel, and I lounge by a swimming pool that’s just metres from the start of the sand. Out of respect for my new, one-humped friend, I opt against the camel meatballs for dinner. Swimming pools, hot showers, cold beers, and fancy hotels? Did I really see the Sahara? Hamu might say no, but exploring one of the world’s great wildernesses requires serious time and energy commitment. While nomads use the derogatory Coca-Cola tag, I see it as Erg Chebbi’s greatest asset. For minimal effort and cost, visitors can now get a glimpse of this untamed land. 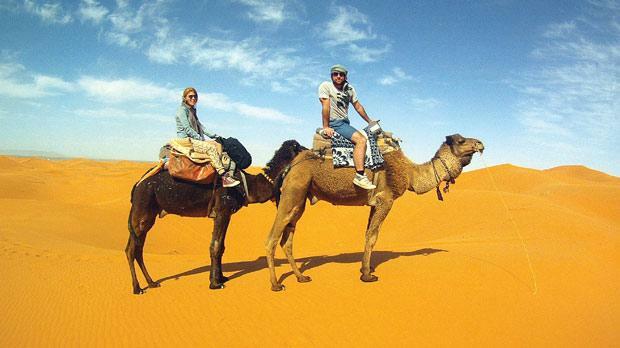 The tourism industry has even managed to alleviate a lot of the desert discomfort. Most enticingly, Hamu and his one-humped friends are making a breathtakingly surreal environment accessible.